This easy light summer salad, made with cucumbers, strawberries, almonds and fresh herbs is great alongside grilled chicken, fish or for a light lunch you can double the serving and add some goat cheese to the mix or serve it over quinoa for more protein. 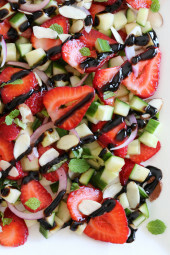 I’m love using balsamic glaze over salads, it’s not just pretty it’s sweet and tangy and there’s no need for oil. Delallo makes the best one I’ve tried, but I’ve also seen the glaze at Trader Joes. If you don’t have it, you can certainly drizzle the salad with regular balsamic, although it won’t be as pretty. 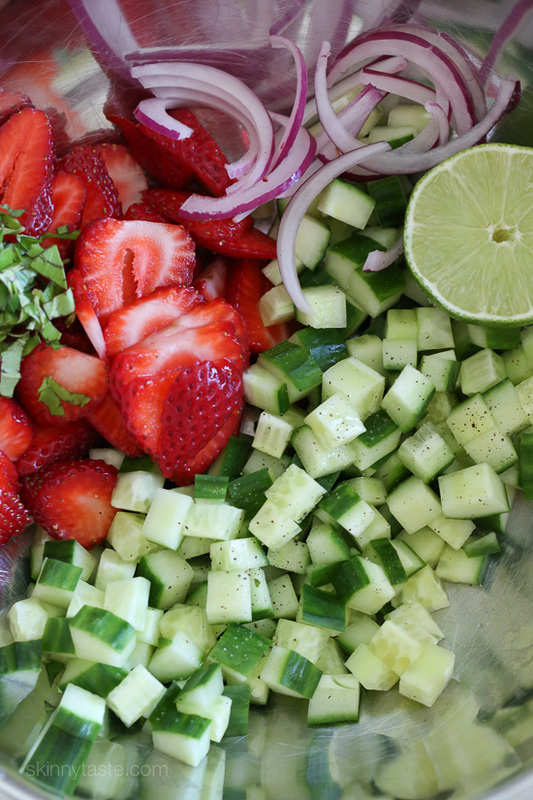 Combine strawberries, onions, cucumbers, mint, basil, lime juice, salt and pepper. Lightly drizzle with balsamic glaze and finish with slivered almonds. Does reduced down Balsamic vinegar have sugar in it and is it vegan? I’ve made this salad a few times and really enjoy it! How do you think it would be with some shaved Parmesan mixed in? This was very good! I made my own balsamic glaze too. Excellent and very refreshing. If the glaze has 10g of sugar, how it is Whole 30 compliant? I made this to eat for a light lunch with a small group. No one cared for it. It was decided that it should be served as a side dish, or as Gina said, with cheese mixed in. It is VERY REFRESHING! A good palate cleanser. Salad is so yummy I tried making my own glaze but failed lol. I found glaze at Walmart by balsamic viniger. I’m thinking about making this for a work potluck lunch next week to balance out the fried chicken and brownies I am sure will be offered. If i mixed it up the night before, would it hold up for lunch the next day? Since they are both pretty watery it might not, I would make it that morning. 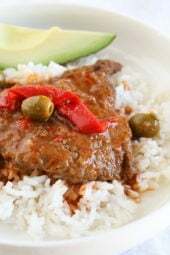 I just found your website and tried this recipe. Delicious! First time I’ve tried the balsamic glaze. I’m hooked. I didn't try the recipe yet, but was interested in the glaze. So I bought the Trader Joes version. OMGosh! I'm addicted. It's delicious! I'm using it all the time. Thank you! Hi Gina! If I made this the night before and just waited to add the balsamic until the day of would it still stay fresh? Thank you! It’s best to make it just before eating. I had this for lunch today and it was delicious! I added a tbs of goat cheese and it went really well with last nights leftover Persian turkey kofta kabobs! I love white balsamics — peach, pear, etc. And they are not ugly and brown on a salad! Gina, can you recommend a type of lettuce to serve this over? Maybe arugula or baby kale? Never thought of combining strawberries with cucumbers but what a great idea. I already have cucumbers in the fridge, so it's just a case of getting some berries. And agree with you on balsamic – use it everywhere. Wow, always love salad but I haven't added strawberry to mine ever before. I'm curious with the combination of strawberry and cucumber for the mixed salad like this. A little sour flavor of strawberry and fresh flavor of cucumber resulting in… Will try to see. How long would this keep in the refrigerator? I would like to have this in my lunch several days in a row. I don't know if I could make the entire recipe at once or have to mix it in smaller batches the night before I want to eat it. What would you suggest? It would be best eaten the same day you make it. I am not a fan of onions, any suggestions for a replacement? 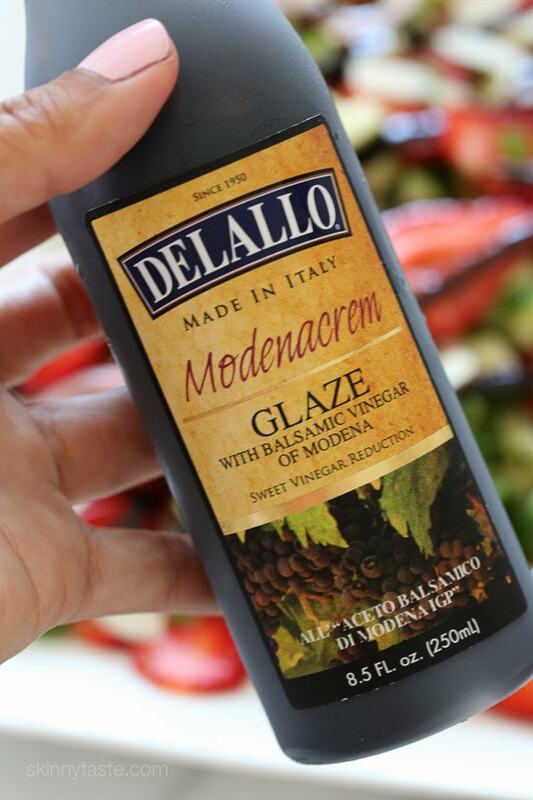 If you don't want to purchase the glaze, don't use regular balsamic. Not because of looks so much, but because all you need to do is put regular balsamic on the stove for a bit to reduce, let it cool and bam, you have just saved $8. 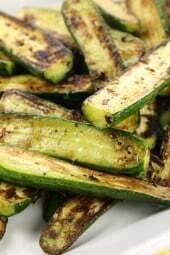 You can even add things like cinnamon, rosemary, additional sugar, or zest to flavor the glaze. The glaze and the vinegar aren't necessarily interchangeable. I did this glaze for the Bean Caprese salad. There was a significant difference in the flavor between reg balsamic and making the glaze. The glaze really added the flavor. It is delicious..
Ahh, love the taste of some fresh strawberries.. So I will definitely try this salad! Thanks for sharing! The recipe looks amazing – thanks for sharing. Isn't there a way to make balsamic glaze relatively easily? Seems like a more efficient thing to do than to buy a bottle that you may not end up fully utilizing. I've made the glaze, it's easier to buy the bottle. It will stay fresh in your fridge. We use it on quite a bit around here, from caprese salad to watermelon salad! Buying the reduction is sooooo much easier! Keeps for quite a while in the fridge, and can be used in a ton of stuff! Tomato, mozzarella, basil – bruschetta – chicken – steak rolls…..
Made it! Its great! Thanks Gina! I will have to try to find that glaze or something similar. The salad looks really tasty. 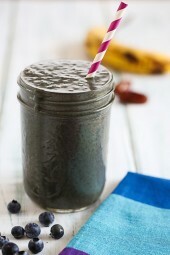 That looks amazing, and super easy! 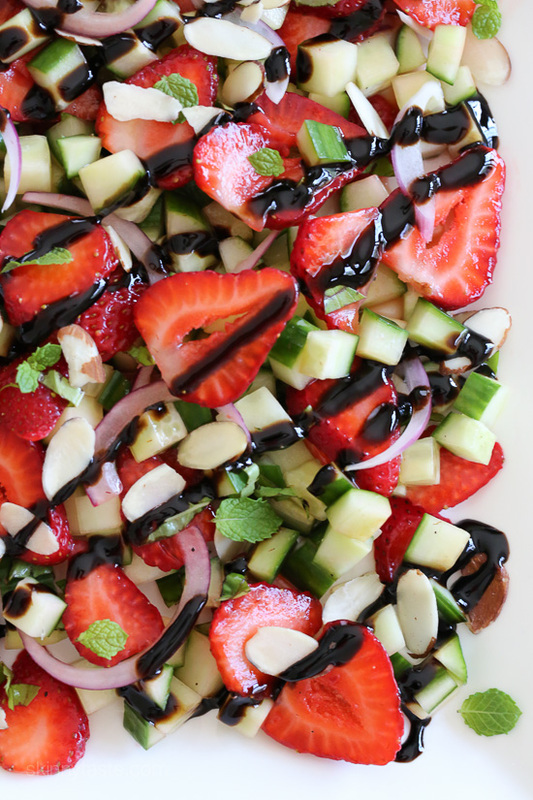 The strawberry/onion/balsamic combo sounds incredible, perfect for the hot summer!